This is one of many posts that are part of the series Jen’s Guide – Best Places to Eat in Hong Kong for Visitors. This is also post #49 part of my #50PostsIn50Days personal challenge to document my first 100 days in Hong Kong. Other posts in this series may be found at the bottom of the original post. This wasn’t just any milestone birthday. This was a milestone birthday that occurred right after we had moved internationally, relocating to the other side of the globe. We hadn’t made new friends yet, and all of our old friends were really, really far away. Despite those obstacles, a whole group of Bryan’s closest friends, eight in total, made a special effort to fly all the way out to Hong Kong (from Boston!) in order to celebrate this special birthday with him. It was hard to choose a place that would be fitting. We wanted it to be special (Bryan likes his fine wining and dining) and unique as well. Some of our friends are reasonably well-traveled and have dined at their fair share of fancy French restaurants. I was looking for something different. We ended up at Bo Innovation, a restaurant serving uniquely Hong Kong-focused “X-treme Cuisine” inspired by traditional Hong Kong classics using modern, “molecular” techniques. We thought the Hong Kong focus would make it special for our friends, and the innovative cooking would be fun for everyone. Bo Innovation interprets Hong Kong flavors in a modern way. Executive chef Alvin Cheung was born in Britain and raised in Canada, but has Hong Kong roots. Trained as a sound engineer, he worked for twenty years as an engineer before branching out and opening his own restaurant. Despite not having formal culinary training, Chef Cheung rocked the food world with his creative, sometimes crazy, molecular approach to Chinese food. In 2014 Bo Innovation received three Michelin stars (after bumbling around zero, one, and two stars for several years), and has maintained it ever since. The restaurant has also been on the S. Pellegrino Asia’s Top 50 list in the past, though it is currently not on the list. I’ve had molecular interpretations of other cuisines in other countries, such as in Spain (where it arguably started), Japan, and the US. It’s hit or miss for me, but I’d never had Chinese food this way, so I was quite curious. The tasting menu at Bo Innovation is called A Hong Kong Story and brings us on a nostalgic journey of Hong Kong through the eyes of food. We started with antique-looking plates that were “decorated in Hong Kong, made in Japan” and dated back to 1950 (!). As we sipped our wine and marveled at the plates, we nibbled on pickled vegetables and beans. The first course was called Smell My Granny. The server brought out a bottle of Florida water, a cologne water popular in Hong Kong since the early 1900’s. The smell probably reminds Hong Kong people of their grandmothers, who used it a lot. The server poured the Florida water onto tightly rolled cylinders, which expanded into wet towels for us to use to clean our hands. Dry ice underneath also created smoke, resulting in a surreal hand-wiping experience that probably did smell like Grandma for our friends at the table who had Cantonese grandmothers. Child’s Play, the second course, evoked nostalgia in multiple ways. Each diner received a different board representing old Chinese games. On each board we enjoyed a bite that represented traditional Hong Kong street eats. Crispy chicken skin with scallions and a mayo sauce. A cookie macaron of sorts. A deep fried savory ball. My favorite was the modified Hong Kong waffle filled with scallions and jamon Iberico. I loved the savory interpretation, and the light, crispy Hong Kong “crisps” were fun to eat straight out of the paper bag (as if I were actually eating street food!). Dim Sum Extreme was a humble Cantonese dim sum item, the taro puff, elevated to extreme levels. Inside a delicate taro puff nest sat a smoked quail egg topped with caviar and gold. Delicious and definitely crazy over-the-top. Our next coures was X-treme “xiao long bao”, one of Bo Innovation’s signature dishes. Made to look like dragon eyes, these spherified balls exploded with an intense clear soup that tastes like a pork xiao long bao, or soup dumpling. The flavor was surprising real, though at the end of the day, it wasn’t quite as satisfying as eating a real xiao long bao. It was definitely an interesting experience, though. Green eggs and magnolia ham was our quirky next course. This involved a white chocolate egg shell (with green specks!) topped with cured magnolia ham and filled with essence of century egg and pickled ginger. Aberdeen is a port area in south side of Hong Kong and used to be a fishing village. As an ode to this area, the sweet shrimp in this next course, called Aberdeen Floaters, was plated in a way that made it look like it was floating on the water. 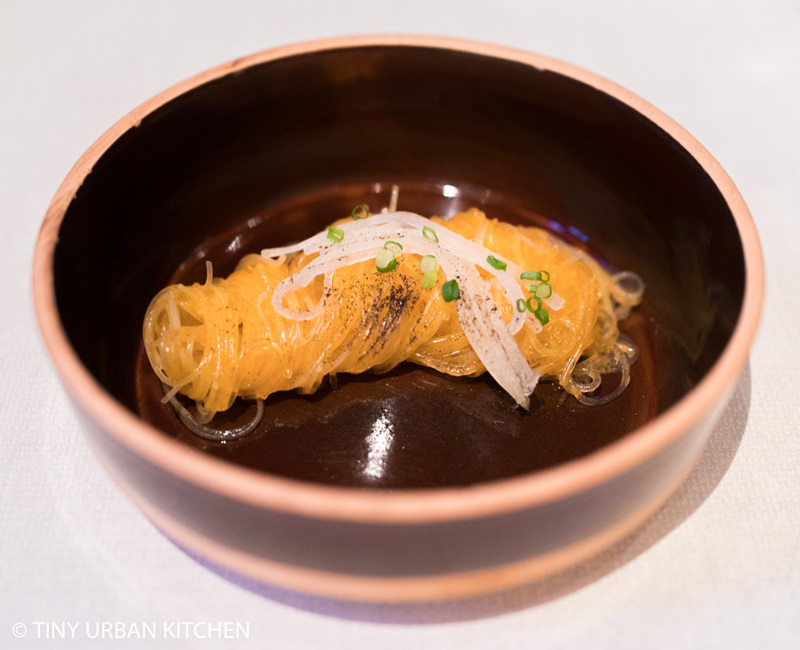 With the shrimp came these “har mi” (dried shrimp) vermicelli noodles topped with pickle fuzzy melon. 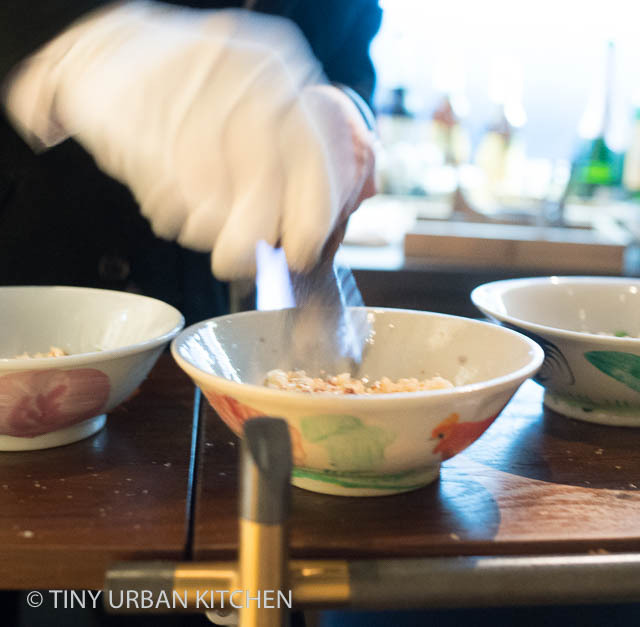 The noodles came tossed in a house-made shrimp oil made from kinki (fish), soy salt, and dried shrimp. They gave us each a small bottle of the homemade “har mi” oil in case we wanted to add more to our plate. I really enjoyed the artistry in this next course, Ode to the Dragon. Each person received a different plate where the Chinese word for “dragon” was written in different styles using a black garlic sauce as “paint.” This came with a single fried oyster tofu. We then moved onto Bamboo Matrix, which involved seared foie gras, “chu yeh ching” miso, and compressed green apple cubes served with black charred bamboo mantau (steamed buns) on the side. We constructed our own little foie gras steamed bun sandwiches. The next course, 60,000 a year, came served in a baby food jar and was reminiscent of Singapore’s famous chili crab dish, reduced down into a simple, scoop-able form. We even ate out of kids’ spoons. The flavor was lovely; the experience was . . . . interesting. Pat Chun is a well known, local Hong Kong producer of many sauces. The next course, called Postnatal Fancy, involved eating tomato that had been poached in Pat Chun vinegar. Essence of ginger and cucumber came in freeze-dried ice form, which was poured into the dish! Here’s the cold ice . . .
Our net course, The Imperial Beggar Banquet, consisted of blue lobster from Brittany, France served with sea urchin, hawthorn berry, green peppercorn, and freeze dried pineapple pieces. Qing Cocktail was essentially a boozy palate cleanser made with a Moutai branded baijiu, a type of strong Chinese spirit, blended together with calamansi (a citrus) and an egg white. The Moutai definitely cut the sweetness and it was pleasant to drink, although it was physically a bit awkward slurping it out of the traditional bowls they gave us. Our seafood course, Classic Upgrade, was a simple dish, an elevated version of Cantonese steamed fish made with wild black cod, jamon Iberico, shimeji mushrooms, dried mandarin peel, and yuzu. For our final meat course, we were “Back on the Street” again, this time eating grilled beef from skewers. A3 saga-gyu beef came cooked with black truffle, “cheung fun” (Cantonese rice rolls), and soy sauce. This dish was fabulous and I remembered wishing we had a few more pieces, ha ha. The meat was tender, and the flavors were intense and rich. For the next course, the server started by holding up a bowl with a painting of a chicken on it to explain the next dish, The Chicken Bowl. Clay pots rice restaurants can be found all over Hong Kong. You often see them cooking the pots over charcoal outside the building. Bo’s version is upgraded with a chicken rice that’s made with dried abalone and topped with shaved air dried foie gras. Birthday boy had the honors of smelling the rice first . . . yum! The server finished the dish off by shaving air dried foie gras on top. This dish was impressive and definitely quite flavorful as well. For this next course, the servers brought out a little box that started playing (over and over . . . ) a lady singing a traditional Chinese song. As we strained to hear our server explain this next dish, Everything Lotus, the song droned on and on. Everything Lotus is a dessert that incorporates different aspects of lotus, including lotus seed, lotus root, lotus leaf, lotus flower, and lily bulb. The dessert was quite lovely, even if the music got a bit nauseating after awhile. No Shark Fin, the second dessert course, imitated the texture of shark fin by using grapefruit instead, whose little individual citrus “caviar” pods have a texture not unlike shark fin. This was served with spherified balls and sorbet of mango and coconut. It was a light, refreshing dessert with pleasant aromatic fruit flavors. The end of the evening, the server brought out a HUGE Polaroid camera and took a photo of all of us. He immediately printed out the photo and included it in a nice little Bo Innovation card. We each received a few postcards with photos of Hong Kong’s eight treasures (eight culinary ingredients reflected in our meal) as well as photos of old Hong Kong. And yes, we enjoyed quite a few wines that night (!). We bought some from the restaurant, and also brought a few bottles ourselves. The normal corkage fee is HKD $500 + 10% per 750ml bottle and HKD$1000+10% corkage fee per magnum bottle. However, if you purchase wine from the restaurant, you can bring an “equivalent” amount and corkage will be waived (maximum three different vintages or labels brought in from the outside). We ended with some fun petit fours that were inspired by the eight treasures of hong kong: walnut, dried mandarin peel, dragon eye fruit, wolfberry, osmanthus, pandan, rose, and jujube. We each enjoyed a bag of popcorn and had an opportunity to the help-yourself candy grab from a bin containing nostalgic Hong Kong candies as well as the white rabbit candy that everyone (even me!) remembers. There’s no doubt that the meal we experienced at Bo Innovation was unique in the ways in which it wove Hong Kong culture, cuisine, and nostalgia throughout the molecular-inspired meal. There’s a part of me that even wishes I had waited until I had lived in Hong Kong longer before experiencing the meal. There is so much Hong Kong history and culture peppered through the meal, it’s hard to fully appreciate it without having some of that understanding. Overall, the food was edgy and impressive. Not everything worked perfectly. This meal was not defined by transcendent flavors or incredibly sophisticated flavor combinations. Instead, it was more defined by its crazy story, artistic interpretations, and sometimes just downright weird courses. It’s the type of meal that is interesting to try once, but I sort of suspect there are very, very few repeat visitors. If I were a visitor to Hong Kong, frankly, I’m not sure if I would come here. Like I said earlier, you may not appreciate all of the Hong Kong references as much as someone who has lived here for awhile. Flavor-wise, you’ll probably get better renditions of these flavors eating the original version compared to the spherified, freeze-dried, or gelatinized version. However, if you’re academically curious about food, and if you are open to trying something a bit wackier, there’s still reason to come experience this meal. For sure there’s no other meal quite like it in the world. The restaurant has an address on Johnston Road but the entrance is actually on Ship Street. Go to the J Residences and go up to the second floor. Dress code is smart casual. Bo Innovation has a private room that you can book. The minimum charge is HKD $30,000+10% (food and drink). Considering their tasting menus cost either HKD $2100 or HKD $2,500 per person, this option probably only makes sense if you have a larger group. You can optionally choose a wine pairing, such as the Premium pairing (7 labels of wine HKD $1,380) or the Grand Cru pairing (5 labels of wine HKD $1,880). Wow, what an amazing experience and what an epic post! It was so cool to read all the details of the different courses!